For many years now, Four Horseman has been a Legacy combo deck that has been pseudo-banned. The deck features Basalt Monolith and Mesmeric Orb, and utilizes these cards to mill itself infinitely, one card at a time. You use the likes of Narcomoeba and Cabal Therapy to strip your opponent’s hand, with Emrakul, the Aeons Torn to shuffle back all your resources. The problem for this deck appears when you try to actually win the game. The win condition is to resolve a Dread Return. However, there’s never a guarantee that you’ll hit all your Narcomoebas, a Dread Return, and your Dread Return target before your Emrakul. Given infinite time, you’ll eventually get to combo off. However, there is no guarantee that, within a round, you’ll be able to go through enough random permutations of your deck to win the game. Because the only thing that changes in a given cycle through your deck is that you have a new, random arrangement of cards in your library, you aren’t really changing the gamestate, and the combination of actions the deck requires falls under stalling. The core combo here is the same as it is in Legacy. 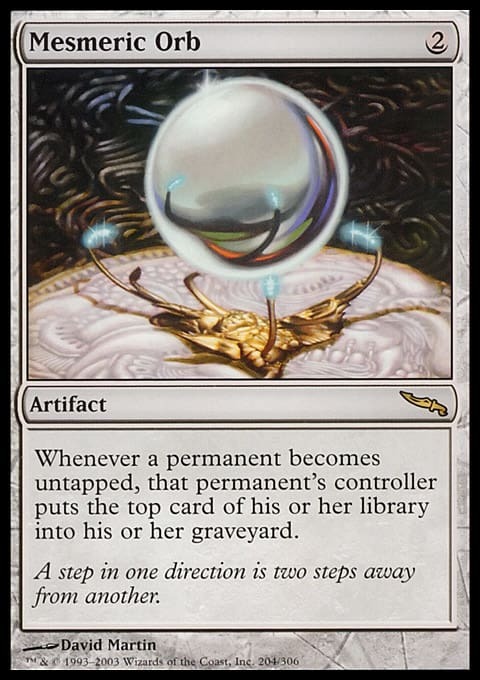 Mesmeric Orb, untap effects, and graveyard shenanigans. There are a few key differences to note. The first is that this deck can actually change the gamestate as it cycles through its deck. The key is Intruder Alarm. Intruder Alarm combines with Forbidden Orchard and untap effects like Fatestitcher and Kiora's Follower to let you continuously tap and untap permanents while changing the gamestate, either by giving your opponent creatures or by generating mana each time you untap all your creatures. This allows the deck to avoid falling under the definition of stalling. The second big difference is that you’re trying to cast Unburial Rites rather than Dread Return. This works out all right because you already require Fatestitcher and Kiora's Follower to be able to mill yourself infinitely, so finding another Fatestitcher along the way to generate infinite mana isn’t a huge deal. The fact that you’re looking to pay mana for your reanimation spell rather than hitting enough Narcomoebas makes it slightly less unlikely for you to hit the combination of cards you need in the appropriate order. So what is the final combo? You’re looking to cast Unburial Rites to put Sharuum the Hegemon into play and rebuy Blasting Station. Once Blasting Station is in play you can continue cycling through your deck to find Narcomoebas so that each Narcomoeba can generate a Blasting Station trigger. If you’re looking to play a whacky combo deck that relies on some rather unorthodox interactions, this may be the best chance you’re going to get. For many years, Four Horseman has been a really interesting thought experiment - a combo deck that actually has some number of advantages over existing combo decks, but just isn’t playable because there’s no guarantee that you can win the game in a 50 minute round. I don’t know about anyone else, but I find it equal parts exciting and terrifying to see a variant of this deck that may actually be legal to play at an event, and I can’t wait to see someone give it a shot.